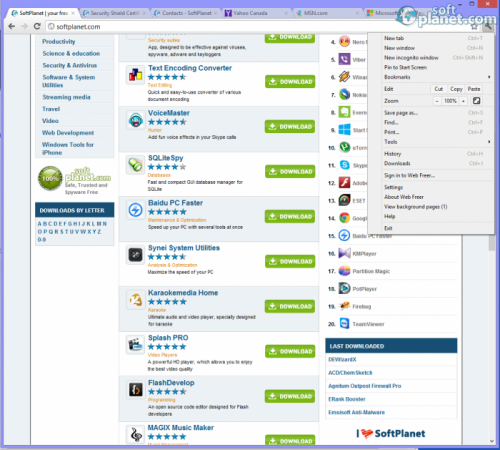 SoftPlanet makes it possible for everyone to get free Web Freer download directly from our servers. There is no registration needed for downloading. 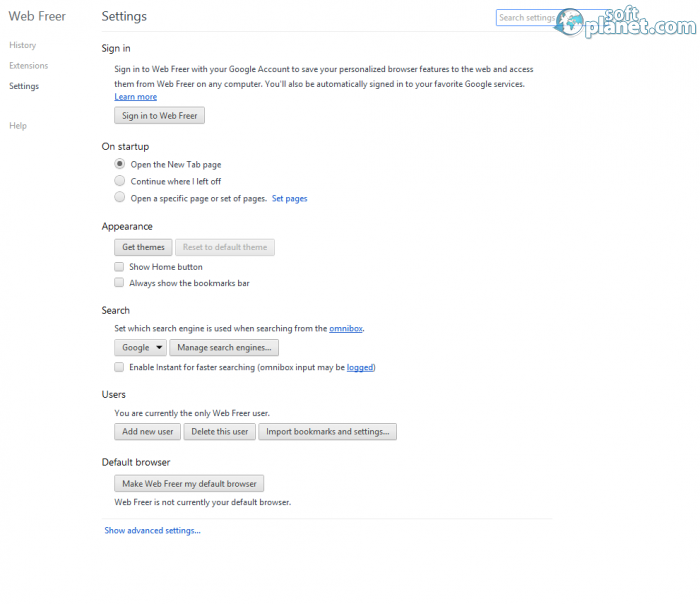 If you browse the Internet a lot you may consider to increase your privacy and thus to protect your browsing data. 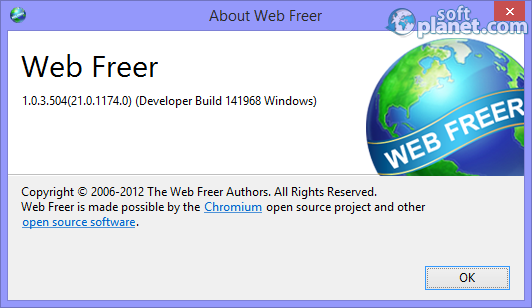 Web Freer 1.0.3.504 is an open source application that is built based on the Chromium engine and pretends to be even faster than Google Chrome. At the same time the privacy of its users is increased as well as their IP addresses are blocked from being displayed to the rest of the world. The main purpose of this app is to combine the user-friendly environment of one of the well-known web browsers with a higher security. Web Freer can protect you by hiding your ID address and encrypting all your browsing sessions. At the same time you will be allowed to open blocked sites – these are the websites that are blocked by your ISP. Other than that you probably won't find any differences between this program and Google's browser. The interface of Web Freer as you suspect looks absolutely the same as the one found in Google Chrome. The address bar, all buttons and their functions are also the same. At first sight you can tell the difference only if you open the Settings drop-down menu and find this line there: “About Web Freer”. 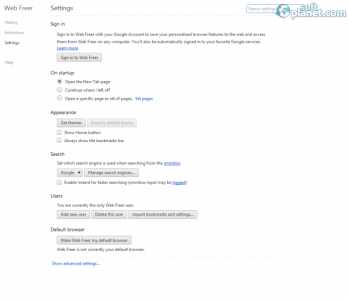 You can use it in exactly the same way and you can do the same things with it as with Chrome. The similarities of this program to the rest in its category are a lot. But the difference is that Web Freer works right out of the box and without any additional settings or options to be activated. Its protection is engaged right after you open the application and for most novice users this is a huge advantage. Web Freer is one of these types of programs that you wish you have discovered a long time ago. Some of you may not see its positive sides, but in fact there are people that will evaluate its capabilities as deserved. Our security scan shows that Web Freer is clean from viruses. The current version of Web Freer has been scanned by our system, which contains 46 different anti-virus algorithms. That ensures that Web Freer 1.0.3.504 is 100% safe for your computer.